A city in the eastern part of the Jordan district, which is designated in Numbers (xxxii. 3, 38), Joshua (xiii. 17), and Chronicles (v. 8) as Israelitish (Reubenitish), and in Jeremiah (xlviii. 23) and Ezekiel (xxv. 9) as Moabitish. According to the inscription on the Moabite Stone (lines 9 30), this city was reconquered by King Mesha after it had become, under Omri, one of the cities of the Israelites. The site of Baal-meon, which is declared by Eusebius to be at a distance of nine Roman miles from Heshbon, is marked by the ruins of Ma'in. The remains of buildings show the Roman style of architecture. In a number of houses the lower part is hewn out of the rock. As Eusebius uses the name "Baian" ("Onomastica Sacra," ed. Lagarde, ccxxxii. 40) for "Beon" (Num. xxxii. 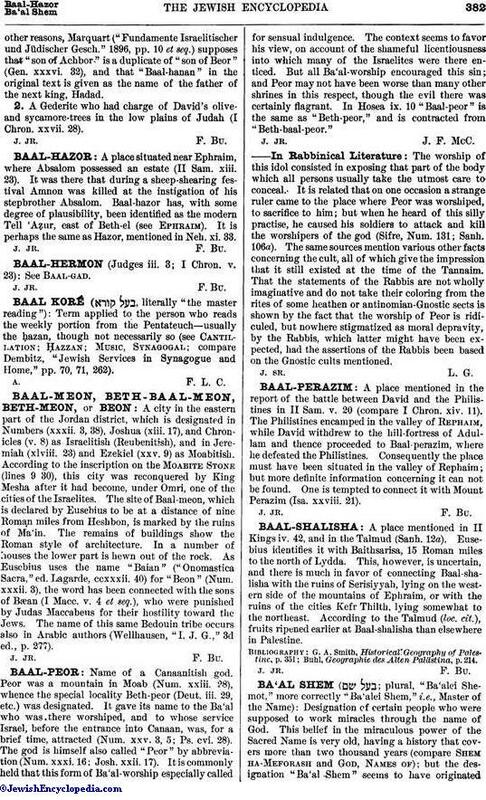 3), the word has been connected with the sons of Bæan (I Macc. v. 4 et seq. ), who were punished by Judas Maccabeus for their hostility toward the Jews. The name of this same Bedouin tribe occurs also in Arabic authors (Wellhausen, "I. J. G.," 3d ed., p. 277).